GEA Group: The Dip Is Over, What Now? The stock of GEA Group has had a massive reversion since I recommended a purchase back in February. At current levels, the stock is back to what I consider to be a fair valuation. I no longer believe you should buy the stock at current prices, but rather wait for another dip. In this article, I'll review one of my recommendations, the GEA Group (OTCPK:GEAGF, OTCPK:GEAGY), which I wrote about in my February article entitled "GEA Group: Prepare To Load Up On This Undervalued, German Giant." In that article, I recommended purchasing at levels of €19-21, as I believed the stock to be undervalued. In this article, I'll go through the result of that recommendation and how I've acted now that the stock has shot back up to pre-dip levels of ~€26. I'll argue and show you as to why I believe you're better off waiting for another dip prior to entering the stock at this time. Back in February, I began to load up on GEA shares step by step. I bought at three different price points and correctly predicted the reversion to a more standard, historical company valuation (in terms of 2018-2019), with that reversion coming sooner than I'd anticipated. As of 12th of April, my invested capital had grown by 32.55% in less than 2 months. Given GEA's history and despite numerous shortfalls, continuing profitability (The company's dividend has grown by 325% in 10 years), and history of product excellence, diversification, and international profile, I believe the company has a part to play in feeding our planet - and as such, filling the shareholder's - our - wallets. Well, a few things happened that I expected due to the company's profile but the market and relevant analysts did not expect to materialize as good as it did. 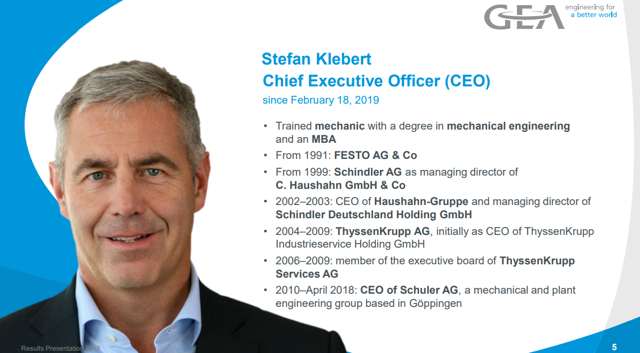 The company also goes out of its way to present its new CEO, who brings with him an impressive list of previous positions with almost 20 years of CEO experiences in industrial Germany. A strength, to be certain, but not something to ever take at face value. However, the new CEO brings also with him clear successes from, among other things, the Haushahn Group, where he spearheaded a successful change in the organization of the same kind that GEA Group now requires. The same was true for his tenure in ThyssenKrupp AG, where he was active, among other things, in setting up working subsidiaries in central/eastern Europe. I wouldn't compare his resume to that of Larry Culp (yet), but he seems to know what he's doing. The group/company dividend remained unchanged, something i believe has contributed greatly to the development of the stock price for the past 2 months. In doing so, the company moves beyond its fundamental goals of distributing 40-50% of company net income. The Supervisory Board and Executive Board will propose that the Annual General Meeting approve payout of an unchanged dividend of EUR 0.85 per share for the 2018 fiscal year. 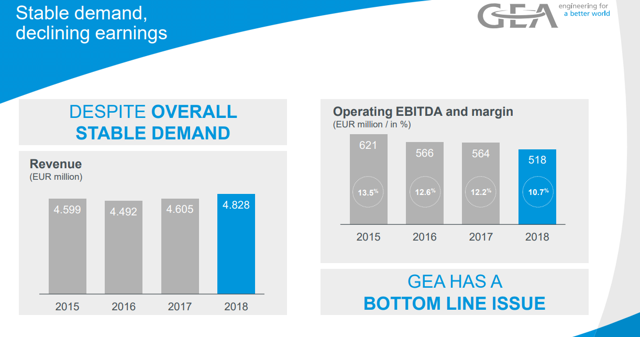 In doing so, GEA will go beyond its fundamental target of distributing 40 to 50 percent of group earnings, thus underscoring its unaltered belief in its operational strength. So, these things are some of what may have contributed to the stock reversion we're seeing in GEA at this time/have seen in the past few months. In my article about the company, I referred to the fact that GEA has, multiple times, failed spectacularly to meet its own guidance in terms of EBITDA and other key metrics. What I could have elaborated on further in that article is the fact that this has been a trend for some time at this company now and the specifics of these failures. The issues within GEA contributing to these EBITDA/Earnings problems are fundamental and internal. Several business segments within the company are not operating at top efficiency (putting it mildly). 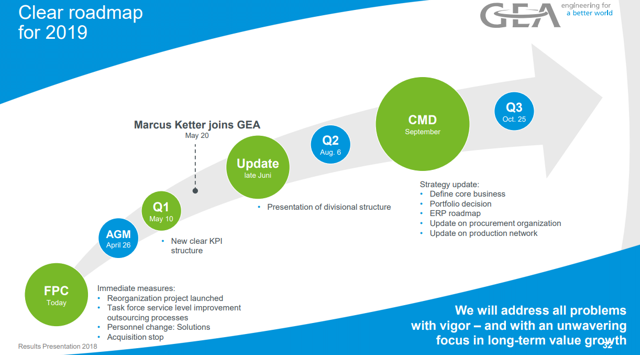 Now, as of FY18, GEA has initiated a portfolio review as well as multiple restructuring programs across the business to come to grips with these problems. The company is well aware of its current problems. Its margin erosion is not due to external demand failures/drops, but due to internal concerns regarding procurement, responsibility policies, IT and Production processes (ironic for a company that manufactures processing machines). The FY report reads like a political statement, and as you can see above, the challenges the company has undertaken for the FY19 are daunting indeed. Which brings me to the point of the article I want to raise. I no longer believe that the stock, at this time, has an appealing valuation. Given the challenges ahead, which are numerous and fundamental, and the lack of credibility in company guidance going forward, the stock price has reached undesirable heights. When it climbed over €25/share and reverted to the level of November 2018, where it has hovered since the extent of these problems materialized, I now believe it unwise to buy this company at fair value until we have a clearer picture. When I recommended GEA, I pointed to an obvious undervaluation even in terms of the most fundamental principles. 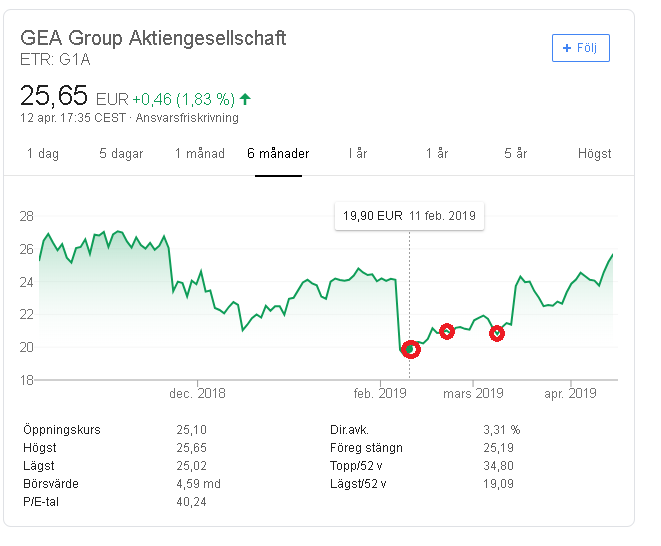 The company's value, according to the market, was far below that of its peers, and the stock yielded more than twice as much as similar competitors, such as Alfa Laval (OTCPK:ALFVF) with a solid safety to its balance sheet. While I wouldn't necessarily classify it as a mistake to buy GEA at this level, I don't believe the current stock price justifies enough the risk/reward ratio of the challenges the company faces. However, in this case, I believe an investment in a company facing these risks requires a greater reward - a lower entry point, which compounds annual growth and yields a greater dividend. An undervaluation of the stock price is required to me. For a company facing these sorts of challenges, I like to see a 15-20% discount to DCF fair value, which in GEA's case would bring the preferred price to ~€20, between 20% and 30% above current levels. If you're more prone to trading, I believe this could mark a good time to harvest some gains. 32% in 2 months is nothing to sneeze at, and you could take some of those capital gains and invest in other things - or wait for the stock to fall and load up once more. If you're a B&H investor like me, you'll probably want to keep your shares and see what happens, but my recommendation at this valuation is that you do not buy further. As of the share price of ~25€ and above, I'm recommending a "Hold" for shares of the GEA Group, and I advise you not to buy further until the picture regarding the company's restructuring plan begins to become clearer during the later parts of 2019. Should the stock dip again due to unfavorable 1Q19 or 2Q19, there may be an opportunity to extend your exposure to the share, but at these valuations, I consider the risk/reward not worth it to expand potential positions further. Disclosure: I am/we are long GEAGF, GEAGY. I wrote this article myself, and it expresses my own opinions. I am not receiving compensation for it (other than from Seeking Alpha). I have no business relationship with any company whose stock is mentioned in this article.